NASA has unveiled a new tool that allows scientists to see which cities will be underwater if certain glaciers melt, and it's quite an alarming projection. NASA scientists are making an alarming prediction using a new tool to forecast what cities will be most vulnerable to flooding as the polar ice caps melt and raise sea levels. They used the spin and gravity of the Earth to predict where all this new water would be redistributed globally should the worst come to pass. 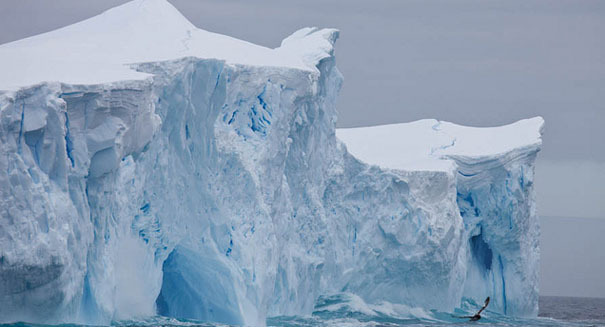 The findings were published in the journal Science Advances and suggest which ice sheets are of the biggest concern based on what cities they will most likely affect. It’s difficult to create forecasting models for future ice changes, which is part of the reason for this effort to shed some light on the subject. New York City appears to face an exceptionally grave risk, as Hurricane Sandy showed a few years ago. They wanted to map out “fingerprint gradients” to form a new diagnosis tool that allow for better assessment of coastal flooding. The extent of the flooding is dependent not just on worldwide sea levels, but on things like the drainage system in that particular city, for example. “The flood hazard in New York City depends on both storm surges and rising sea levels,” reads the intro from the paper. “We combine modeled storm surges with probabilistic sea-level rise projections to asses s future coastal inundation in New York City from the preindustrial era through 2300 CE. The storm surges are derived from large sets of synthetic tropical cyclones, downscaled from RCP8.5 simulations from three CMIP5 models. The sea-level rise projections account for potential partial collapse of the Antarctic ice sheet in assessing future coastal inundation.